Moving is both a stressful and joyous experience, but it’s often more stressful when you’re doing it at the very last minute or leaving your hometown before you feel ready. Are you wondering how to tell when it’s the perfect time to call the moving services and relocate? Check your life for these six common signs that it’s time to make a move. Whether you have a developing relationship in a far off city or just love spending your free time there, it’s a good sign that you’re ready to move. 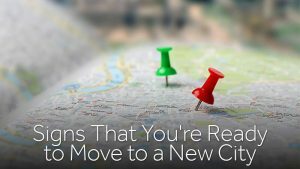 Building ties with a new area before you move is a great way to make sure it’s where you want to spend at least a few years, since moving around every few months quickly becomes exhausting. No longer want to become a Broadway star? Ready to start an organic strawberry farm instead? Making the move from somewhere like NYC to Idaho is daunting, but it’s well worth the effort if it allows you to pursue new dreams, goals and relationships with people you haven’t met yet. Most families move with at least one member protesting the change, but the majority of the family should at least understand the reasons for relocation. Whether it’s to access better schools or to give your spouse a chance at continuing his or her education, don’t forget to include your family’s needs in the decision. 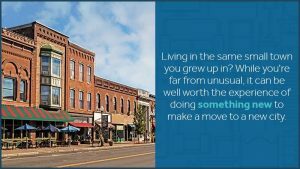 Living in the same small town you grew up in? While you’re far from unusual, it can be well worth the experience of doing something new to make a move to a new city. Even if you return later because it truly is your favorite place in world, you’ll come back with a larger perspective on the world and more appreciation for what’s really great about your hometown. Conversely, it’s also time to move if you can’t stop comparing your current city to your former hometown and you find that your last location was better. Many people stick it out through years of unhappiness in big cities because they don’t want to look like they’ve made a mistake in moving away. However, all that unhappiness is hardly worth being able to brag about never going back home. Finally, those months or years of seething resentment towards city council or the weather in your current city aren’t worth the stress. Relocate when you realize you just don’t like your location anymore, even when it’s for relatively petty reasons. If you’re moving in the Columbus area, Zippy Shell can help. We serve the greater Columbus area, so if you’re moving from Westerville to Downtown, we can drop off one of our shell’s and get you ready to go! Or, if you’re moving from farther away and need a place to store some belongings until your new home or apartment is ready, Zippy Shell has great storage services for a great price. Our prices are 20 percent lower than any of our competitors. If you’re currently storing items in a location charging more than $149, we’ll give you 20 percent off storage and help move your items into the new Zippy Shell storage unit for free.